It was a dark, cold Tuesday evening in January. I arrived at Fabrications craft emporium, the textile and up-cycling shop on Broadway Market and was met by a cheerful, textile banner hanging in the window; “Let’s Stitch”, rallying people to sew. I was greeted by Barley (the owner), and Sarah Corbett, who was leading the sold out Craftivism workshop that evening. The workshop commenced with copious amounts of tea, which seemed fitting for an evening of needlework and contemplation. 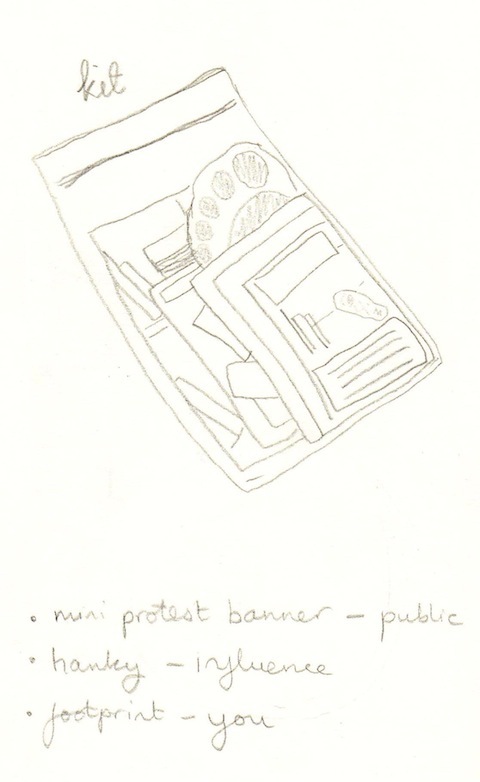 Sarah explained the origins of Craftivism; of Betsy Greer and the knitting group, how Sarah had felt inspired, wished to join a movement and found a need for one. 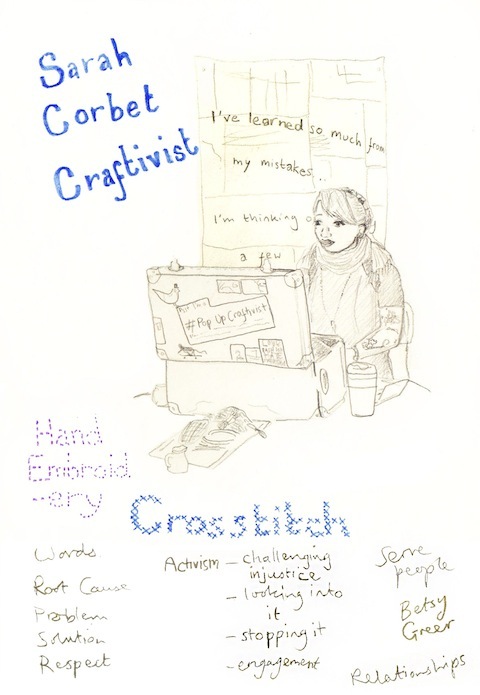 How through this she formed the Craftivist Collective, of what Craftivism was and wasn’t and how Craftivism differs and complements Activism. After this we took in turns to say who we were and why we came to the workshop. Attending were a variety of people who had taken different paths to arrive at this workshop from; crafters to activists, students, charity workers, innovators, grow-your-own advocates and friends. The room now felt like a community. The footprint kits were given out. 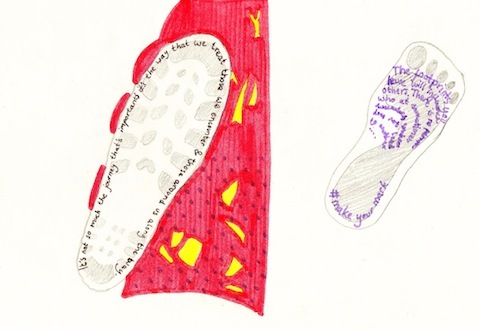 Among other things they contained a needle, thread, an instruction leaflet and fabric with either a printed foot or shoe tread. We were directed to the leaflet, which wasn’t just sewing instructions, but encouraged the reader to consider their life, value, place in the world, and what kind of message on their footprint would be beneficial to themselves and the world. We were encouraged to quietly read and contemplate, then share in pairs and finally to the whole group. With such a diverse group it made sense that answers differed. Showing that people had really thought it through. We then moved to writing on the footprints. The words could be an inspirational quote or our own musings, but importantly in our own handwriting, making it personal. We moved to technique and stitching, with chattering as people became acquainted with the methods, it struck me how much people were keen to help each other, which felt so right for this community. Followed by silent stitching to instrumental music. The lack of lyrics was important in case the words influenced our stitching. 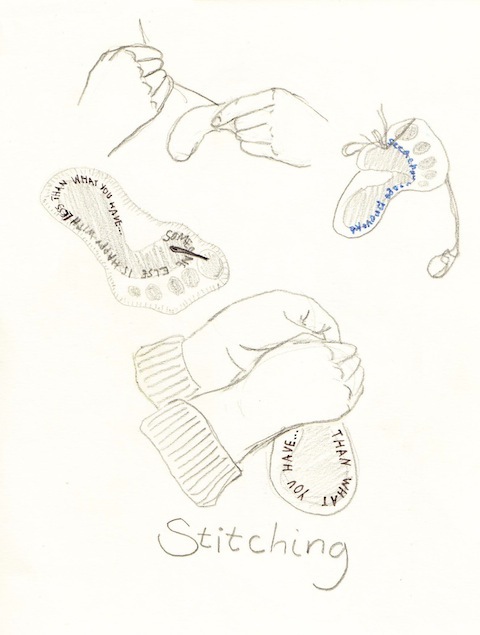 The workshop concluded with chatter whilst stitching and the encouragement to finish the footprint in our time. It was never the intention to finish the footprint in workshop, and nobody had. The plan was this project would take place over many occasions, allowing people to think it though and discuss it with others. So why did I go? 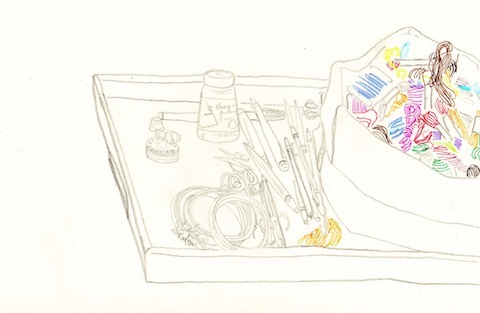 I wasn’t stitching; I was a fly on the wall, with a sketchbook. 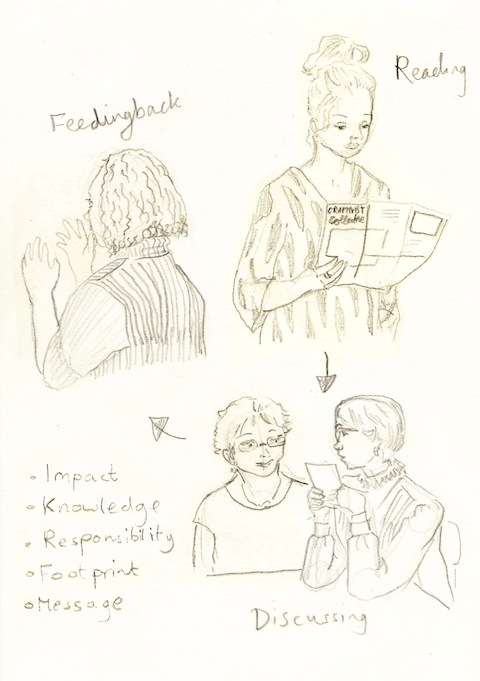 I am undertaking a reportage illustration competition on the theme social conscience. Initially I found this daunting. Would any Cause let me draw them? Were there ethical and consent issues to consider? But the Craftivists were welcoming and likewise they use art forms to provoke and query ethically issues. 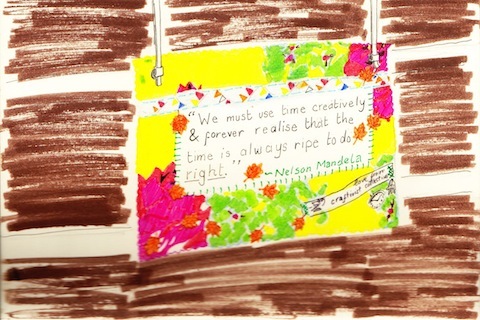 I thoroughly enjoyed myself and hope to participate in many future Craftivist activities.